This book sheds light on the changing nature of contemporary Japan by decoding a range of political, economic and social boundaries. With a focus on the period following the inauguration of Prime Minister Koizumi Junichirō, the book grows out of a recognition that, with the Koizumi administration playing a more proactive role internationally and moving ahead with deregulation and the ‘structural reform’ of the economy domestically, a range of boundaries have been challenged and reinscribed. Here ‘boundaries’ refers to the ways in which contemporary Japan is shaped as a separate entity by the inscription and reinscription of political, economic and social space creating insiders and outsiders, both internationally and domestically. The central argument of the book is that, in order to achieve the twin goals of greater international proactivity and domestic reform, the government and other actors supporting Koizumi’s new direction for Japan needed to take action in order to destabilize and reformulate a range of extant boundaries. While boundaries often remain invisible, the aim of this book is to promote an understanding of their significance by uncovering their pivotal role. 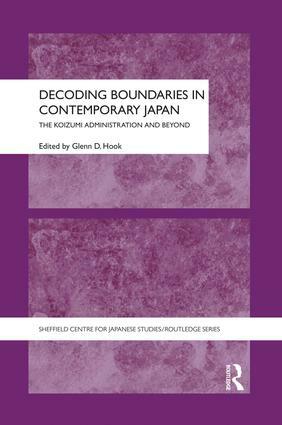 Decoding Boundaries in Contemporary Japan brings together contributions from leading and emerging scholars from the UK, Japan and the United States. It will appeal to scholars and students of Japan as well as social scientists with an interest in borders and boundaries, political scientists interested in Asia.